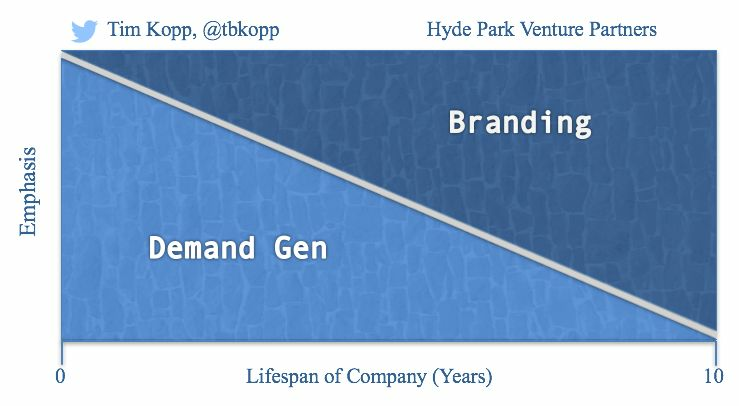 Demand Gen vs. Branding: Which is More Important? This is the question many startup founders and marketing leaders ask themselves when it comes to marketing. Marketing encompasses a lot these days, and figuring out where to focus your time and energy early on can be daunting. As an early stage investor, one of my favorite aspects of my job is to be as helpful as possible on a startup’s go-to market strategy. One of the most common questions I get asked, sometimes phrased different ways is, which is more important, demand gen or branding? And the answer, not surprisingly, is that … it depends. That’s not a cop out, it’s simply the truth. The answer depends on the stage of your company. Directionally, early on in the lifecycle of a startup – you need to be heads down and focused on generating demand and finding customers. As the startup scales and gains traction, it’s a gradual shift from generating demand to fulfilling demand. This happens through building a brand. Caveats: For companies establishing new categories of software, it’s more critical to dial up branding quickly. Another exception would be for companies that have received significant funding rounds, especially in B2C models. Speed is important to capture audience, and they have the luxury of emphasizing awareness as the top priority immediately. To me, it’s a warning sign if an early stage startup isn’t obsessive about demand generation. Early on, it’s survival mode. It’s the time to grind, get paying customers, actively seek product/market fit (and keep it! ), and dial in key metrics (unit economics) in preparation to scale. It’s important to emphasize demand gen in the context of identifying the cost of acquiring customers (CAC) and the lifetime value of those customers (LTV). As a startup scales and builds traction in the market, branding becomes more important. The tipping point isn’t necessarily a specific point in time, but a natural progression that happens in lockstep with your demand gen efforts. To the marketing leaders out there working through your marketing goals and priorities, please realize this isn’t about branding or demand gen being right or wrong. Your demand gen and branding efforts do not operate in silos, they complement each other like art and science. To create marketing magic, you have to capitalize at the intersection of the two and find a balance. For me, demand gen is the proving grounds for marketers to build internal credibility, and make the business case for marketing investment. Establishing momentum early means more than putting company logos on your website or investor deck. For an early-stage startup, your leads are everything. Without them, you’ll be out of runway before you can even finalize your logo design. Credibility begins with demand gen ― with defining your sales funnel, your sales cycle, qualifying your leads, and overall, juicing the system to be measurable, predictable, and impactful. Only then will your startup gain the traction it needs through real, live, paying customers. It’s during this stage that hiring the right team members is key. Right now, your marketing priorities are analytical, and your team needs to reflect that. Finding the right analyst and operations talent to manage data quality and data cleanup will be important in the success of your demand gen efforts. There will be an opportunity to hire the marketers who will own communications, branding, events, and so on, but until your demand gen proves itself, you’re not there yet. Also during this stage, your company’s VP Finance or CFO should become your best friend. Your focus should be on making all of your marketing efforts quantifiable. By cleaning up your data and maintaining the quality of your data, you’ll know your numbers like the back of your hand and will have a clearer vision of where you need to go. In particular, as a marketer, you should get crystal clear on what percentage of revenue you own driving for the sales team, customer acquisition cost (CAC), conversion rates, and cost per qualified opportunity. Overall, keep it simple. Understand that in order to eventually build a brand, you need to build trust and credibility. And to build credibility, you need demand gen. The two biggest factors that fast track demand gen efforts are getting control of your marketing data and hiring the right people. If you don’t try to force branding and instead, allow your demand gen efforts to take hold, your brand has no choice but to naturally evolve. You’ll reach a tipping point – a time when you don’t need to focus on demand gen as much, because your brand begins to drive significant inbound interest. At ExactTarget, we experienced the tipping point in our last couple years prior to our IPO in 2012. There wasn’t as much focus on pure lead gen in the marketing department because there didn’t need to be. We had reached the dominant position in our market, and now our marketing efforts could be more focused on dominant share of voice, activities like user conferences, thought leadership, sales enablement, and so on. As you’re transitioning from demand gen to branding, it’s important to continue executing on demand gen tactics that are also focused on brand building, when possible. My philosophy was to tackle two birds with one stone as frequently as possible. Even when brand building, demand gen was an objective. As the pendulum shifts, your focus becomes the quality of leads rather than the quantity of leads you obtain. Brand-focused marketing efforts like events, user conferences and content are all strategic facets of this approach. Crushing demand gen gives you both the political (and literal) capital to focus on building the brand. In the end, every company that wins relies on their brand to generate inbound. You don’t become a category leader overnight. You get there by focusing on generating demand.